A similar attack in Damascus last year targeted one of the most revered Shiite shrines and was claimed by Islamic State militants. BEIRUT: Twin blasts Saturday near holy shrines frequented by Shiites in the Syrian capital Damascus killed at least 40 people, most of them Iraqis, according to Syrian and Iraqi officials. There was no immediate claim of responsibility for the attacks. Islamic State militants have carried out similar attacks before against Shiite shrines in the Syrian capital and elsewhere. Extremist Sunni groups, such as IS, view Shiites as apostates and consider shrines a form of idolatry. Syrian State TV aired footage from the scene showing blood-soaked streets and several damaged buses in a parking lot, apparently where the explosions went off near Bab al-Saghir cemetery. The cemetery is one of Damascus' most ancient and is where several prominent religious figures are buried. Interior Minister Mohammed al-Shaar visited the wounded in local hospitals. He said 40 were killed and 120 were wounded. He said the attacks targeted civilians, including Arab visitors, who were touring area's shrines. Iraq's Foreign Ministry said in a statement that at least 40 Iraqis were killed and 120 wounded. Ministry spokesman Ahmed Jamal said buses carrying Iraqi pilgrims to the shrines were targeted. He said a crisis response team has been formed to expedite the identification and transport of the killed and wounded. "The ministry calls on the international community to condemn this heinous terrorist crime that targeted civilian Iraqi visitors to the holy shrines. It also urges a firm and decisive stand against the takfiri groups responsible for them," Jamal said in a statement. Takfiri is an Arabic derogatory term referring to extremist Sunni Muslims — such as members of the Islamic State group — who accuse other Muslims of being infidels. Iraqi, Iranian and other Asian Shiites often visit shrines in Syria. There were conflicting reports about what caused the explosions. State news agency SANA said the blasts were caused by bombs placed near the cemetery and that at least 33 were killed and more than a hundred wounded. Lebanon's Al-Manar TV quoted Syrian officials saying twin suicide attacks killed 40. 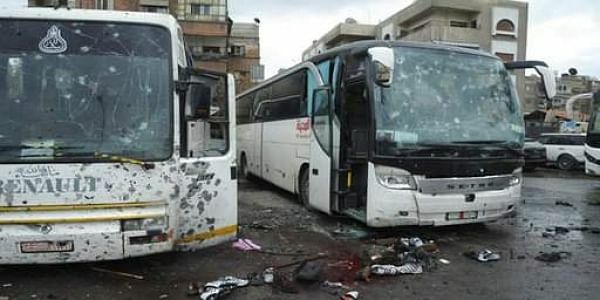 The military media arm of Hezbollah, Lebanon's militant group close to Damascus, said two suicide bombers blew themselves up 15 minutes apart near the shrines, leading to the large number of casualties. Arab TV Al-Mayadeen, airing the conflicting reports, also said at least 40 were killed. The area was sealed after the explosions. The Britain-based Syrian Observatory for Human Rights, an opposition monitoring group with activists on the ground, said at least 46 were killed in the twin explosions. The group said the first blast came after a suicide bomber blew himself up among the pilgrims near the shrines. It was not clear what caused the second explosion, the group said, adding that the death toll is likely higher because dozens were wounded. Mohammed Haytham al-Hosseini, head of the National Hospital in Damascus, told pro-government Sama TV that 41 killed arrived to his facility. He said at least three wounded were in critical condition. Also Saturday, Syria's President Bashar Assad said in an interview that his military's priority is to reach the Islamic State group's de-facto capital of Raqqa — toward which U.S.-backed Kurdish-led forces are also advancing. The interview with Hong-Kong based Phoenix TV was aired Saturday and shared by the Syrian Presidency website. Assad said another IS stronghold, Deir el-Zour, may be targeted in parallel. Syria's battlefields have become increasingly crowded. U.S-led coalition forces in collaboration with Syrian Kurdish fighters as well as Turkish troops and Syrian allies and Syrian government troops, backed by Russia and Iran, are all converging to clear northern Syria of the remnants of Islamic State militants. In some incidents, the teeming battlefield has caused friction between rival groups, as well as several civilian casualties. Assad said that "in theory" he shares the same priority with U.S. President Donald Trump of fighting terrorism but that they have had no formal contact yet. He said Russia, a major ally, hopes it can urge the U.S. and Turkey to cooperate with Moscow and Damascus in the fight against terrorism in Syria. Assad's government views all armed opposition as terrorist groups. Assad said all foreign troops on Syrian soil without invitation or consultation with the Syrian government are considered "invaders."